This tribe was located in what is now the southern Netherlands, on the southern side of the mouth of the Rhine (below modern Utrecht and The Hague), and on both sides of the mouth of the Maas. They were bordered by the Frisii to the north-east, the Batavi to the east, and the Paemani and the Belgic Menapii to the south. During the first century AD their territory was incorporated by Rome into the province of Germania Inferior. Inhabiting part of the Insula Batavorum, this small tribe is commonly held to have been closely related to the neighbouring Batavi, if not a direct division of that larger tribe. The Batavi were originally a constituent part of the Chatti before they migrated westwards before the first century AD. Once settled, the Canninefates probably occupied the western part of the Insula, the Rhynland, Delftland, and Schieland. Going by Ptolemy, Walckenaer extends the limits of the Insula Batavorum to the north of Leyden, reaching Zandwoort, and he gives the same extension to the Canninefates. The tribe's name is an odd one. Variously listed as Cananefates, Caninefates, or even Canenefatae, the meaning generally given is 'leek masters' - not a very warlike name. Apparently the sandy soil of the Rhine delta was perfect for onion growing (and is now just as good for tulip fields). Julius Caesar notes in his Commentaries on the Gallic War that the Batavi live on an island in the Rhine delta. The location is easily defendable and gives its people an unimpeded view deep into Germany beyond the Rhine (ie. outside the Roman dominions). This description of the Batavi (and the Canninefates) must be at a point very shortly after the tribe has migrated into the region. 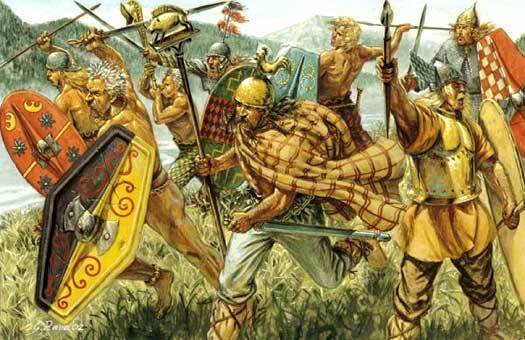 They replace earlier Celtic peoples as the dominant force, but whether they entirely displace the Celts or absorb them and become a new ruling elite is unknown. Equally unknown is their language, whether it remains Germanic, or if it absorbs Belgo-Gallic elements from the locals. It is equally possible that they may straddle both definitions. The Batavi and Canninefates are conquered by Rome by this date (and perhaps a decade earlier) and become subjects of the empire. At this time these tribes still live in small villages of up to a dozen houses located on very fertile land near the rivers. They also value horses highly, with some being included in burials. The Chauci and Frisii are to be found under the command of Gannascus of the Canninefates. Together, they continue to raid the coastline of Gallia Belgica, although the Chauci have been doing this for some years already. The newly-appointed Roman military commander, Corbulo, engages the attackers in battle and defeats them. He also places triremes on the Rhine and takes on the Chauci vessels, successfully destroying those too. Gannascus is driven out of Gallia Belgica and the Frisii are occupied by force. Under the pretence of holding negotiations with Gannascus, the Romans assassinate him. 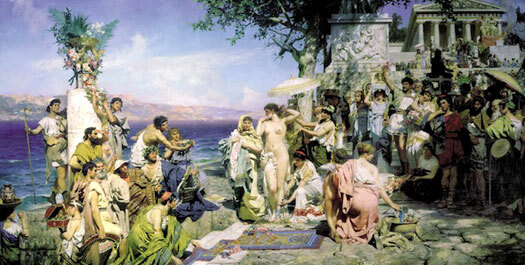 This dishonourable act causes outrage among the Chauci, and Emperor Claudius orders a withdrawal of Roman forces to the Rhine in order to ease tensions. Given the assassination of Gannascus and the withdrawal of the Romans, it seems likely that the tribe selects a new ruler, either an interim figure or the son of Gannascus himself, Brinno. It is certainly Brinno who rules almost twenty years later. His name is probably Celtic, a variant of Brennos (a raven) and cognate with the Gaelic Brian or Bran. It merely means someone with black hair, but it reveals an element of Germanic integration with the local Celts. Son of Gannascus. Led the tribe in the Batavian revolt. 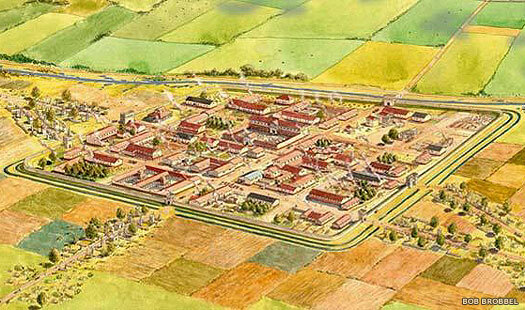 In the second century AD, the area that today forms the southern Netherlands has not one but two important Roman cities. The first is Noviomagus (modern Nijmegen), while the second is Forum Hadriani, near the modern town of Voorburg (close to The Hague). Forum Hadriani gains its name in this year when Emperor Hadrian has the Germanic settlement completely rebuilt in the Roman style. Hadrian even rules the empire from Forum Hadriani for a short time, during one of his progressions through the empire to attend to its various problems. Forum Hadriani is still on the outskirts of the empire, but due to its frontier nature, it has strategic importance, especially while the emperor is residing there. Roman Emperor Antonius Pius gives town rights to the settlement of Forum Hadriani, making it the capital of the civitas of the Canninefates. With a population of about a thousand and streets laid in a grid, it is a typical small Roman town, but it provides an important role in maintaining the troops who guard the northern border of the empire. Coastal raids by barbarians have developed into a serious problem. Archaeological finds for this period show a layer of destruction along a great deal of the North Sea and Atlantic coast of Europe, between Belgica and southern Gaul, and in eastern Britain. The Chauci are prime suspects for the raids, and Rome responds with improved defensive measures over the following thirty years or so. Fortifications are put in place at sites including the Iceni civitas of Venta Icenorum (modern Caistor-by-Norwich), the Trinovantes town of Caesaromagus (modern Chelmsford), and the civitas of the Canninefates, Forum Hadriani. This is the start of the system that will develop into the Saxon Shore in Britain. The Salii, or Salian Franks, seek Roman protection on the Batavian island after being expelled from their own lands by the Saxons. The Roman acceptance of their settlement there marks the beginning of the end for the Batavi and Canninefates as an identifiably separate people, although there is no violence involved in their eventual disappearance. The Batavi are mentioned by Emperor Constantius II in 355, by which time they have become almost wholly absorbed by the Salian Franks who are still migrating across the Rhine and into northern Gaul. Three years later, both the Batavi and Salian Franks are ejected by another tribe (whose name is unknown but the Chamavi have been suggested). Both peoples migrate southwards, farther into Gaul, where they resettle in Brabant, accepted into the northern Roman empire by Julian the Apostate. Eventually the Batavi (and Canninefates, who have almost certainly been dragged along) disappear altogether, absorbed into the growing Frankish tribal conglomeration.